A few dinners in one-pre Dukan. This was a post I never posted until now, it’s a bit late, but it’s what we had before embarking on a fantastic new way of eating, yet somehow similar to how we usually eat, preferring fresh veggies and protein over processed, starchy foods. As far as our choices before the diet, I have to say knowing that we are about to embark on the diet, I was pretty lazy in my food choices and dinners the past few nights. Basically we had a pre-made dinner. Something I don’t like at all, but it wasn’t bad. I bought the pre-made frozen Palak Paneer and the Chana Masala at Trader Joes. The Palak Paneer is a spinach cheese dish and the chana masala is a chickpea dish. Both go really well with scallops. I placed the two frozen dishes in the oven, there is an option for oven or microwave, but I felt far to guilty placing them in the microwave. I then sauteed/seered some scallops, the best I could on our electric burner. I really miss our gas range. I’ve actually never had an electric range before living in this apartment complex and it shows. I can’t seem to get it down. I’ve burned milk numerous amounts of time in my nice milk froather so much that my sour face in the mornings landed me a brand new Nespresso electric froather from my husband for Christmas. It’s amazing. You just press the button and in two seconds you have super foam. Anyway, back to my easy dinner, I put the meals in the oven for 25 mins with the plastic wrap still on, something I didn’t realize the first time I made this dish. I did make a salad -we keep with the French tradition of having a salad after our main course as opposed to before. The indian food was great. We joked about imagining a bunch of indian chefs cooking at Trader Joes. In general, I rarely buy pre-made food but,the pre-made things from Trader Joe’s aren’t bad. But then again because of all these easy dishes, we are now on a diet. I discovered these dishes when I was shopping for New Year’S dinner. Sounds like lame dinner for New Years, but I needed to buy things that could be frozen,since we were returning from Detroit late New Years Eve and none of the stores would be open on New Year’s Day,it’s the best choice. 1 tablespoon of red wine vinegar, or some type of vinegar. toss with field greens and romaine lettuce. What was for dinner the next few nights was just as easy. 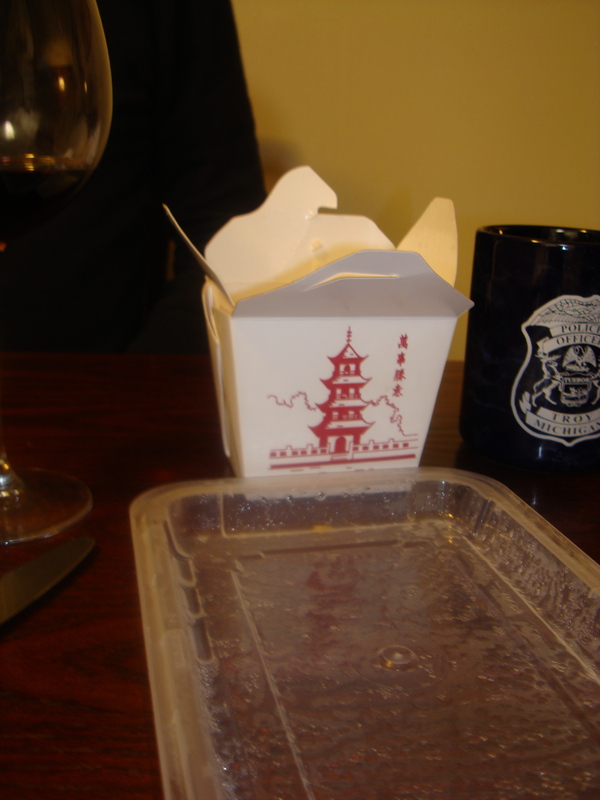 The following night I ordered in from a local Thai restaurant, Swan Thai in the Golden Cove strip mall in Rancho Palos Verdes, which is right next to Trader Joes and Starbucks. It was pretty good. We had drunken noodle with beef, heaven rolls (fresh summer rolls with spicy peanut sauce) and green curry with chicken. We had some left over sauce from the green curry. I saved it and used it for yet another lazy meal. I made stir fry with eggplant, red and yellow peppers, onions and scallops over rice the following night. Tonight I’m sorry to say, for my husband, it won’t be that interesting as I’m making my usual grilled chicken with herb, garlic, lemon and salt. I am finding a slump in my cooking. I think all the holiday meals have kind of set me back. But as far as lazy meals go, these are good. Once we are done with our diet, I will stock the freezer with some pre-made meals, but my hopes are to make many meals and freeze them for ease and health. I am super happy with my Cuisinart ice cream maker. This was a gift about 10 years ago and I put it away for a few years, while living in Italy along with my pasta maker. There was absolutely no point in having either, oh and also my pizza stone. The pizza, pasta and gelato in Italy is really to die for. But now that I’m back in the US, I have taken my ice cream maker and pasta maker out of the moving boxes. I have made several Ben and Jerry’s ice cream recipes with a few modifications. I enjoy them, but it just wasn’t the gelato feel and taste. When in Italy I remember Italians bragging about how gelato is not ice cream and it’s much better for you than ice cream. Well, I felt it was just the Italian way of superiority when it comes to food. But they were right and often when it comes to opinions on food, the Italians have every right to brag. I’ve never tasted such amazing food. A tomato tastes like a tomato! The quality of food is amazing. You have to go food shopping much more often due to such freshness not lasting, unlike the shelf life of an American vegetable. Sometimes I wonder what is on my tomato that it can last weeks in the fridge. Ok back to ice cream. Hmmm, tomato ice cream could be good. Anyway, my staple is an altered Ben and Jerry’s mint chocolate chip recipe. I basically steep real mint into my milk and cream mixture by heating it slightly while I mix the sugar and eggs in a separate bowl. I let the creamy mint mixture cool before adding to my egg mixture. Once it’s cooled I add it all to my fabulous ice cream maker. Once the ice cream is soft enough I add in chopped chocolate, as much or as little as you want. 100 grams or big handful chopped dark or milk chocolate. add all to ice cream maker. Once finished put ice cream in a Tupperware with a thin sheet of syran wrap directly on top of ice cream, this saves some freezer burn. Now onto Gelato. It is in fact much healthier for you. In most of the ice cream recipes I’ve found, 2 cups of cream are required however, I’ve found that gelato is more a milk based ice cream, asking for 2-3 cups of milk. I’ve not tried to make a fat-free ice cream, but it is the works. 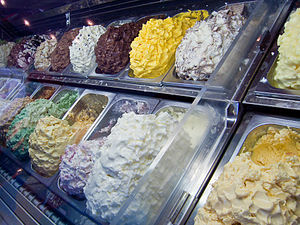 I will however make a full fat gelato first and then make the fat-free version, just in case it’s not good. I will let you know. My custard vanilla American Gelato. I used 1 cup super fine sugar and beat in two eggs and two egg yolks. At the same time I heated up two cups milk with one cup cream. Eventually I will eliminate the cream, but I didn’t want it to go bad, so I used it. I heated the cream and then poured it onto my egg mixture. After that I brought it all back to the pot and cooked till it thickened. I let this now, custard type mixture cool in the fridge a few hours. 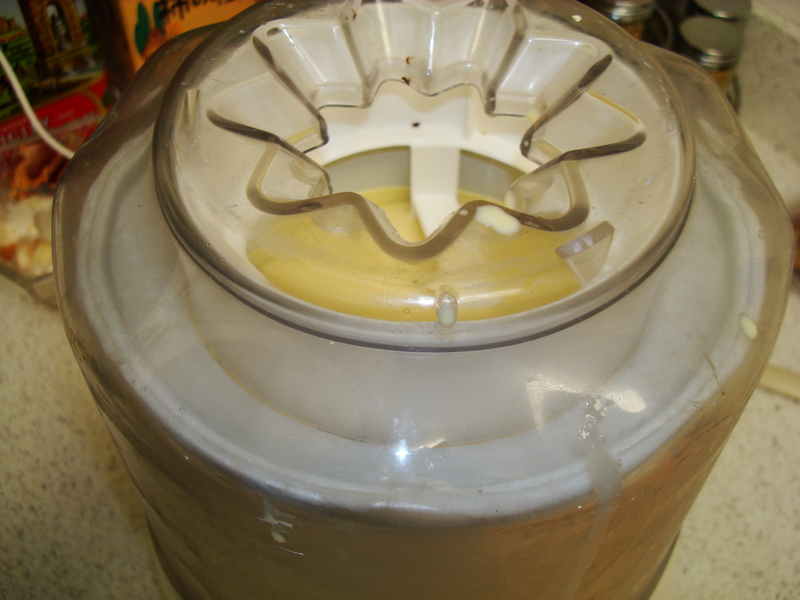 Once cool, I added some vanilla extract and put in my ice cream machine. This was a triple yum!!!!!! More gelato recipes to come. I think that my fat-free version would be a great desert for the Dukan diet. Oh and for the verdict, I’ve turned Italian and prefer the more egg milk based creamy frozen treat! This was for my husband. He is a pasta lover and we both like a good Bolognese sauce, otherwise known as “ragu” in Italy. It is an easy sauce to make, yet it requires many steps. The first step is chop, chop and chop some more. 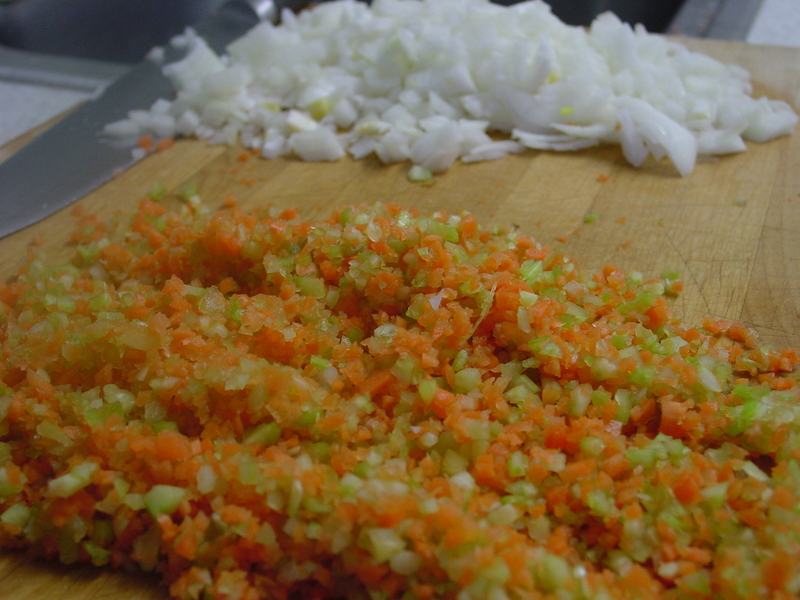 You will need to chop carrots, celery and onions as finely as possible. The onions are chopped separately. I have opted to use fresh tomatoes, you need a lot more, but the results are better. You will get a fresh sauce without all the additives of a canned tomato. I used to blanch my tomatoes to peel them until my mom who swore by this, bought me the zyliss tomato peeler. It is a life saver. 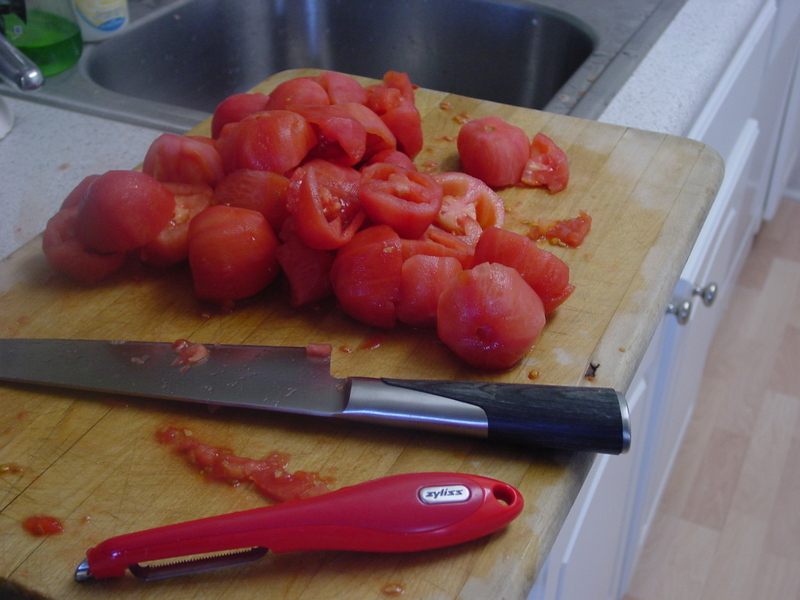 I just peel the tomatoes, de-seed them, buy cutting them in half and squeezing out the seeds out over the sink. Then I dice them. Add a bit of olive oil to a pot and cook the onions for about 3 mins. Add the carrot and celery mix, let cook for a bit, maybe 10 mins. Now all I need is some white wine, a glass for me and about a cup for the sauce. Actually, I also need a wholesome glass of milk, about a cup. Once the carrots, celery and onions are cooked, add in about a pound of beef. I like to actually use about 1/2 lb beef and 1/2 lb ground pork. I think it adds depth to the sauce. Cook the beef/pork till the pink is gone. Add about 1 cup milk and cook till almost evaporated. Then you add about 1 cup dry white wine. Try to use a good quality wine, one that you would want to drink as well, while cooking. After the wine is evaporated add your tomatoes. I use about 4lbs of Roma Tomatoes. You can also use two large cans of whole tomatoes. Add some pepper flakes, not too much, just a few pinches. My friend added about 2 tablespoon full and we spent the evening trying the sauce, adding more tomatoes, trying the sauce again, finding it too hot, added more tomatoes. By the end, we still had a very spicy sauce, but about 6 times the amount, she had enough to feed a small army! Add nutmeg, salt and pepper. You will want to cook your sauce on medium for a bit then reduce to low and simmer for about 2 to 3 hours. This is a great sauce to freeze, but it will also last up to one week in the fridge. I plan to use our left-over sauce to make a Bolognese lasagna with a bechamel sauce. The bechamel is easy to make and more common in Italy than using ricotta, which I feel dries out the lasagna. For those of you following the Dukan diet, this is a great recipe for all phases minus attack. If you are doing the second phase, this is even delicious just alone! This sauce is delicious on pasta and polenta. Enjoy! Yum. There is not a day that I go without eating salad, actually, unless it’s a protein day on the Dukan diet. I love salad after a meal. I was raised French and that is the traditional way to eat a salad, after a meal before the cheese plate and desert- C’est la vie! 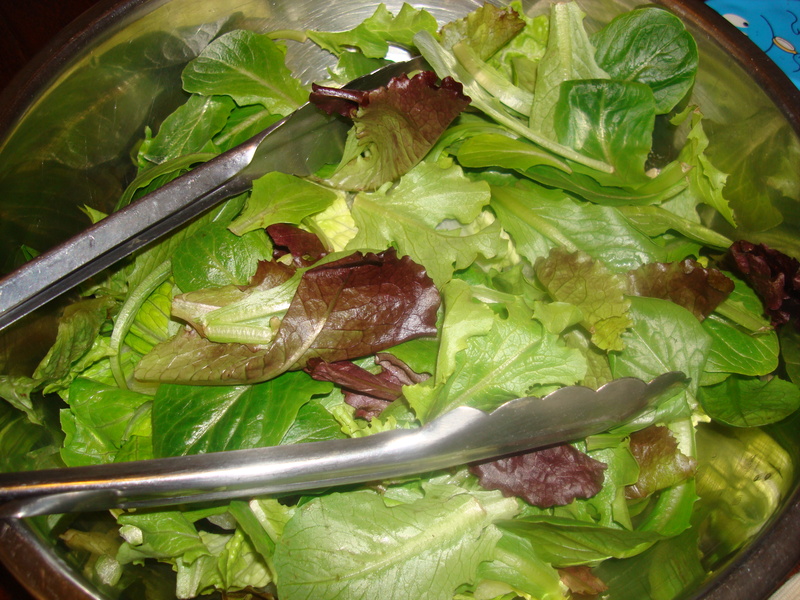 I use mainly organic greens, a mixed variety and then add in some organic romaine lettuce. I have a few recipes for dressings, please when following the Dukan diet, just reduce the olive oil. this keeps in the fridge for 2 weeks. I hope you enjoy salads. Remember try and use as little dressing as possible. Add more vinegar if you need more. I change my salads up on the weekends and turn them into lunches. I’ve added hardboiled eggs, cut up ham or turkey, or even left over tri tip steak, add tomatoes, cucumbers, tri colored peppers, bean sprouts, whatever you add, it’s all good. Tonight was a protein and veggie dinner. I am followin the Dukan diet, as you may know. It’s not so far away from the way we normally eat. We are huge meat/protein eaters and love veggies. I started a low carb regimen last year and found it made a big difference. I’m not huge on diets, but found that taking out the extra carbs helped a lot. Mainly helping my waisteline as well as hunger. I found if I eat larger portions of proteins and veggies, I’m satisfied and feel more full. Carbs just ended up making me more hungry a few hours after eating. I used to always make one veggie, one protein and one startch- that was my thing. Now I do 2 veggies and one protein. Anyway, I’ve been succesful on the Dukan diet. I had gained 8 extra pounds from the holiday treats and managed to loose more than that, almost 10 lbs. My Dukan diet was not intense as I put in my numbers and discovered my recomended weight loss would be 7 lbs. So I lost that plus more. I’m in the 3rd phase of the plan where i”m aloud cheese, bread, 2 starch meals and 2 splurge meals. I am cheating and having wine here and there, more like here! But it’s all working. I continue to do our protein days and protein and veggie days. So we had pork wrapped in red onion. I think this is much, much better with thin slices of Veal. But pork is ok, too. 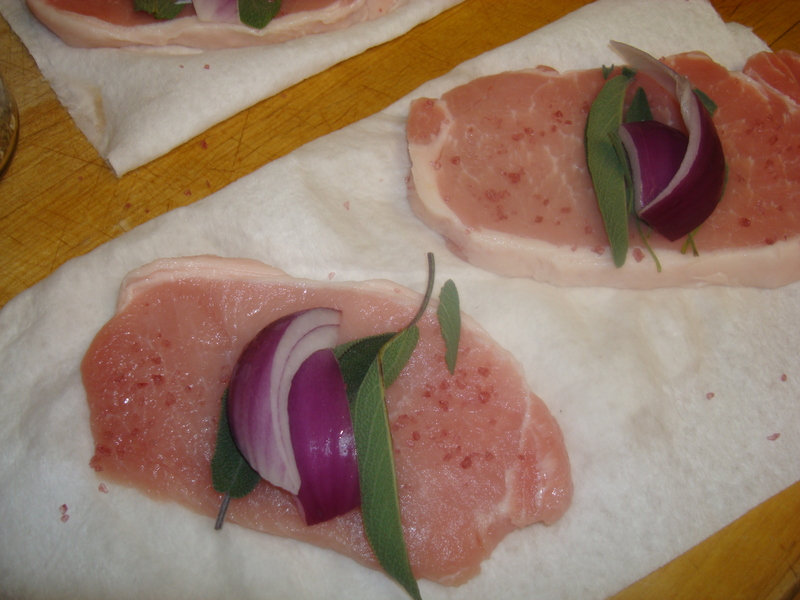 Just wrap each piece with a few pieces of sage, a few pieces of red onions, add salt and pepper, and herbs de provence. I squired it and put it on the grill. I think the grill has made our healthy living work! I also used my cali salt. It’s a red wine infused salt made from California wine and Sonoma salt. It’s gorgeous and the flavors pop. I grilled this for about 10 minutes. It was quite good, but the veal was 10 times better! Finally I get to make my roast chicken!!! And wow, this was quite the chicken. It was huge. I’m just wondering what this organic chicken ate, she was huge! I even had to add another 15 minutes to the cooking. We had leftovers, which is rare for us after a roasted chicken. I used the leftovers for a delicious soup. Chop up all the herbs together, minus the Rosemary. 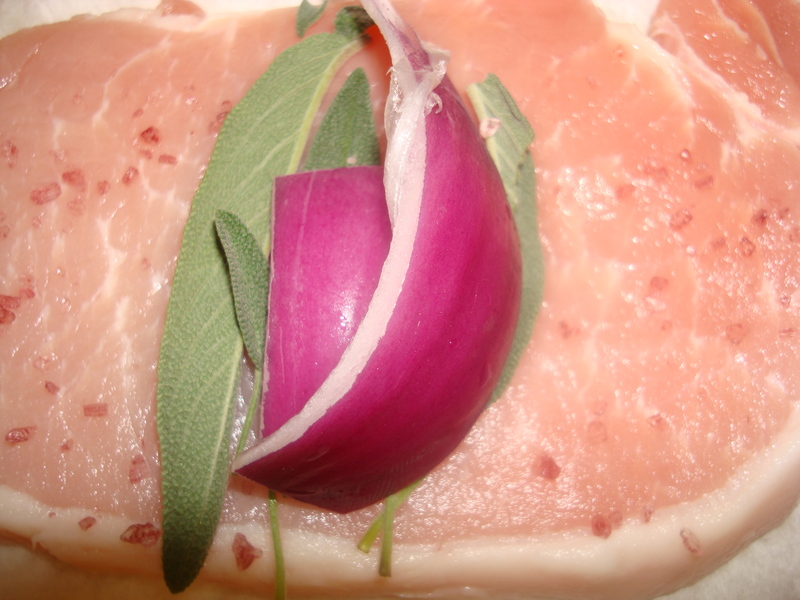 You will put the rosemary in the salted cavity along with the lemon slices. Slice garlic and try and put thin pieces under the skin. 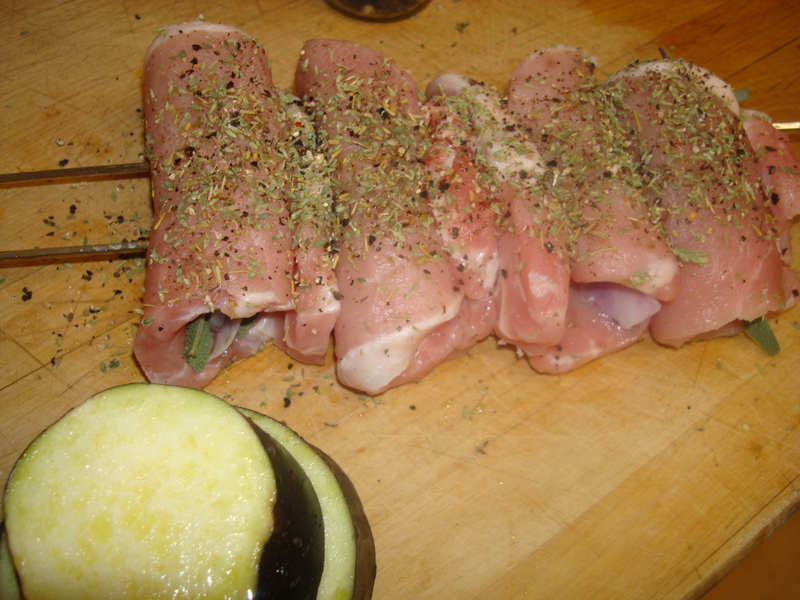 Sprinkle chopped herbs on the chicken. Squeeze lemon juice into the cavity and put the remainder of used lemons in the cavity as well. 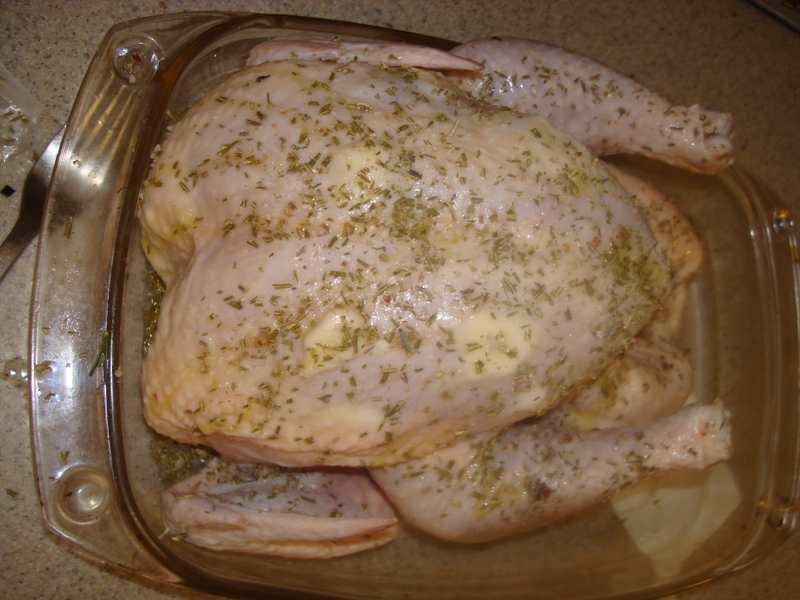 Tie the legs together with some cooking twine and put it in the oven at 350 for about 35 minutes. Turn oven up to 450 for the last 10 mins and baste the chicken. I served this with various veggies: Brussel sprouts and cauliflower. Again, a successful dinner still following the Dukan plan. I’ve lost weight! Keeping with the Dukan diet, we are having protein. I am writing this so late now, I can’t remember when we had what, but this was one of our prefered meals. I am huge on fresh fish, however, the Trader Joe’s frozen swordfish wasn’t bad at all. And you can’t go wrong with a lot of cilantro and lime. 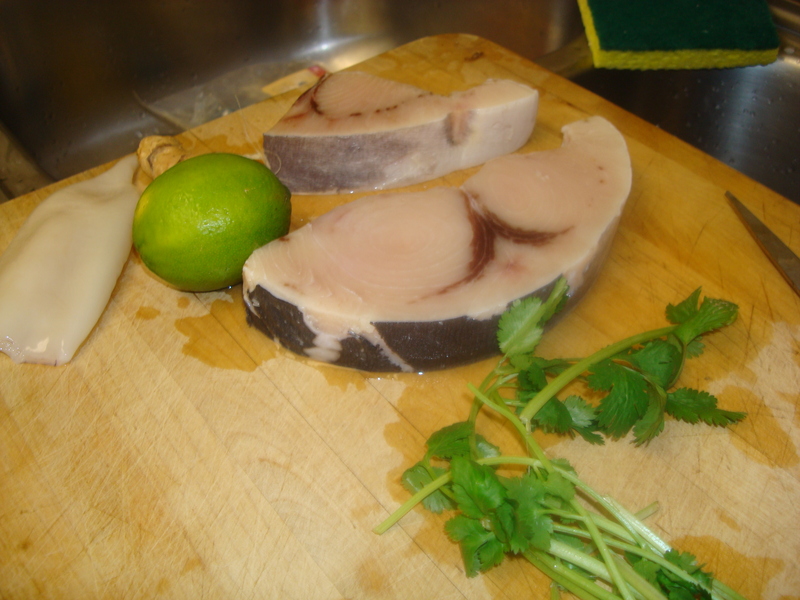 Basically I defrosted the swordfish and cut it up into nice size chunks. 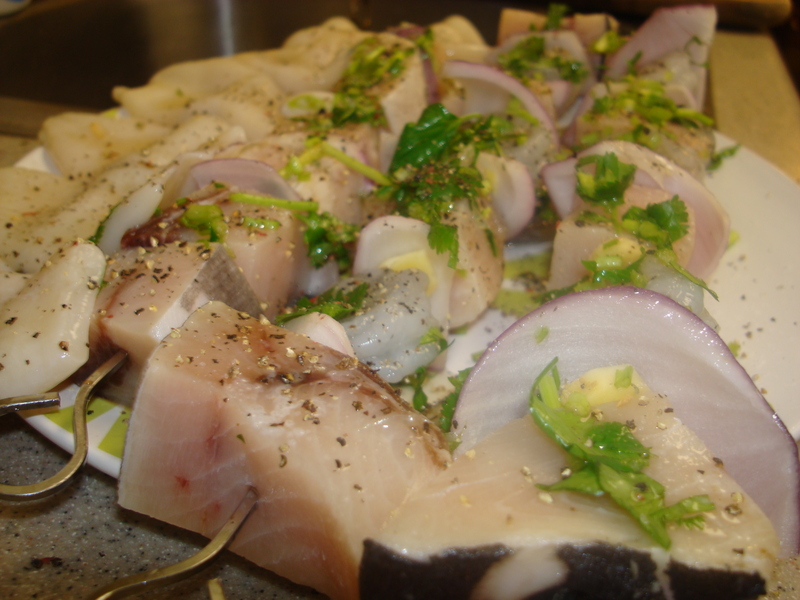 I strung the sticks with one piece of red onion, one piece of fish and so on. I then chopped up some cilantro and squeezed some lime juice. Dusted some salt and pepper and topped it off with the lime, cilantro dressing-no oil at all. I then just strung some calamari on the sticks and added salt and lemon juice. Make sure you don’t add any citrus until you are ready to grill. I put them on the BBQ for about 6 mins-3 mins to each side. This was another YUM making this diet a synch. I bought a large organic chicken at Trader Joes, my local super market. I was happy to make a whole chicken. I planned to bake it at 400 for 45 mins. I had just recently tested out our oven’s self cleaner, something I had neer done before, but the oven needed to be cleaned. I had accidentally, a few weeks back, set the oven to pre-heat without taking my son’s gingerbread house out of the oven. I had hidden it in the oven so he wouldn’t be tempted to pick and eat all the candy off. It was a big allurement that needed to be hidden! Well, his house”burned down” and melted candy was everywhere. Our home smelled of sweet candied ginger for days, maybe why I was eating sweets constantly. Anyway, the oven malfunctioned and locked. I tried to unlock it but ended up breaking the latch and the door wouldn’t shut properly, making the oven incapable of turning on. So my hopes of a nice roasted chicken was gone. What to do? That is where I pulled out the Le Creuset Paella-sized pan and started cutting up my chicken. I added only a bit off olive oil, staying within the Dukan limits, a sliced onion, 2 chopped garlic cloves and shallot to the hot oil. I added some nice dried oregano from Sicily, fresh thyme, oregano, and sage. I let it cook a bit till the onions were opaque and then added my chicken pieces. 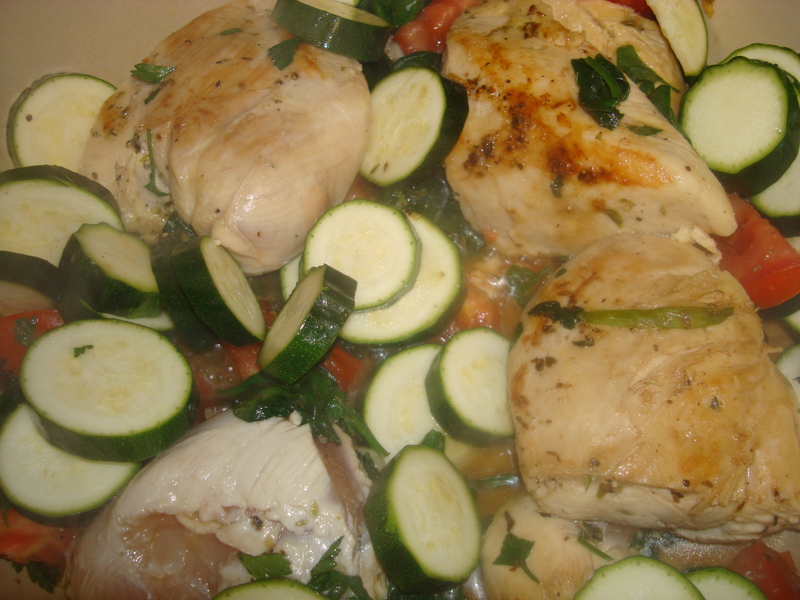 I then added some cut up zucchini, peeled and deseeded tomatoes and a bit of eggplant(about 2 zucchini and 1/2 a big eggplant) It was a type of surprise, a ratatouile, hunters chicken my style. It was a change from the rosemary, lemon garlic roasted chicken but good anyway.